SWEL will undertake a Phase 1 Desktop Study in any part of the UK. This will be a 30 page report written by a Geologist and will be tailor written for your site. SWEL guarantee that your district planning authority's content requirements for a desktop study will be met. A Phase 1 Desktop Study (see an example desktop study) is often required by local planning authorities, when applying for planning permission. New build and change of use both require planning and therefore a Phase 1 Desktop Study to be compiled (desktop study contents), SWEL will undertake a desktop study in any part of the UK. Helpful Note: This is a large page, if you are looking for something in particular why not use "Control (Ctrl) & F" keys pressed together, and use the search box to navigate. It is much quicker than scrolling down! A "Desktop Study" report outlines the Site History, Geology and Hydrogeology, and any environmental risk associated with that particular plot. We put together this information in the form of a Desktop Study Report that can be submitted at the relevant time to the local planning authority. If you are buying land and are worried about possible contamination (an old garage forecourt for example) then it is wise to have an Desktop Study carried out before purchase. Land Contamination may affect the value of the property. The EA has released a collection of "guidance that replaces our document ’Environment Agency requirements for land contamination reports’." The guidance is aimed at land owners, specialists and consultants and clarifies the governments stance on dealing with the large areas of contaminated land in the UK. As well as outlining Environmental Risk a Desktop Study also informs of Geotechnical related risk on the site, known occurrences of subsidence, and man made ground etc. are detailed in the report. Please feel free to telephone the office for a free informal discussion regarding any of the services we provide. Detailed written quotations can be provided upon request. Can I read about an Example Desktop Study? What information is in a Desktop Study? Should I be worried that my LPA have asked for a Desktop Study? Where can I find more information on a Desktop Study? Can I write my own Desktop Study What is the next step after a Desktop Study? How does a Desktop Study Work? Where will SWEL Carry out a Desktop Study? Who will assemble the Desktop Study report? What is the price of a Desktop Study? Desktop Study and Site Investigations Is a Desktop Study just used for planning applications? Can I write my own Desktop Study? Unfortunately not. The Environment Act 1995 Pat 2A states that only a "qualified person" can undertake a Desktop Study. At SWEL we have experienced and educated staff (Who?) that are experienced in assembling Desktop Studies. How does a Desktop Study work? A Desktop Study works by using information from secondary (data, maps) and primary (photos and surveys) sources to establish the risk that exists to future inhabitants of a site, that may or may not be contaminated from historic or present day activities. So unlike a Site Investigation a Desktop Study uses a "Reading" approach rather than a "Digging" approach. A step by step "How it Works"
1 - You give us the "go-ahead". 2 - We collect data on your site. Maps, Pollution Incidents etc. 3 - We visit your site to conduct a walkover survey. 4 - We write the report. 5 - We conclude the report with recommendations as to the risk posed by contaminated land (if any) to future inhabitants, and sensitive receptors in the area. A receptor is anything that may be impacted on by contamination, a river, a tree etc. The first discussion is always free, so drop us a line / call with any questions. What is the cost of a Desktop Study? Almost certainly under a £1000. Any more than that is hard to say, it depends on the size of the site and its past usage. Larger more industrial sites will be more expensive whilst your average back garden will be less. 1 - Petrol Station with Workshops: Walkover Survey will involve entering building, looking down man hole covers, looking in cupboards etc. Surplus to usual secondary information Data will have to be sought from Local Council to confirm / disconfirm the presence of buried tanks. 2 - Back Garden: Will only require the simplest of walkover surveys, and no extra secondary data will be needed (in most cases). We are sorry we can't give a fixed price, but we only need a little bit of information about your site to give you a quote. Give SWEL a ring and we will give you a price instantly, which we will then follow up with a formal quotation, if the price is to your liking! What is the Next Step after a Desktop Study? There often isn't a next step, a Desktop Study is often the only evidence needed to discharge your planning condition. Please ring / email SWEL - Environmental Consultants for informal discussion. Who will Assemble the Desktop Study? A professional environmental geologist with a minimum of 5 years experience will assemble your desktop study report. Should I be worried that my LPA have asked for a Desktop Study? If you have already completed on the sale of your property then yes, perhaps you might be a little apprehensive, the outcome of the desktop study may well have affect on the value of the property you have purchased. If you haven't completed on the purchase then you would be sensible to asses onsite soil quality. Get the desktop study done, if the site has a dubious past then it may be a bargaining chip to reduce the price. i) Petrol Station: Then the outcome of the study will almost certainly recommend further work, namely a Site Investigation. This might equally apply to disused factories, or workshops. iii) Open plot within an Urban Setting: This type of scenario could go either way. Was it allotments or was is a foundry. Only a desktop study will reveal the sites past contamination issues. It is this instance (iii) when a Desktop Study is most useful. So in short you may a have a little worry, but land contamination can in 19/20 cases be adapted to, and if it does turn out that your land is contaminated, it doesn't mean you won't be able to build on it (unless its really bad) and solutions can be found. For a free initial consultation ring / email the office, and we can answer any question you may have. Environmental Consultants. What information is in a desktop study? 1- The Report: It is stipulated in Government Legislation that only a qualified person can make recommendations on brown field development, a SWEL desktop study is only ever assembled by a qualified geo-scientist. In the desktop study there is various generic information regarding to the site, a risk assessment, and recommendations, which will say whether SWEL Environmental Consultants recommend that your build / planning approval go ahead, or that there is a site investigation leading to a quantitative risk assessment. Photos: Photos of the site, especially problem areas, if there are any. 2 - Maps: Historic Maps, Geological Maps, Geo-hydrological Maps, Site Location Maps, Arial Photos. 3- Conceptual Models: Various models are included visually explaining how you site may interact with the environment. The first discussion is always free, so drop us a line / call with any questions. 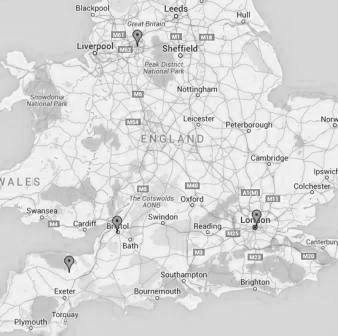 SWEL can provide Desktop Studies in any part of the UK such as Bristol, London, Manchester & Exeter etc. We never charge travel expenses to our clients for Desktop Study Walkover Survey visit, it is included in any price you may receive from us. Charging mileage / travel expenses is against our company ethos. What is the price of a Desktop Study? Certainly less than £1000, unless you site is big. We only need to know the most basic of details to provide a quote so please call us. A desktop study would normally precede a site investigation and many would argue that it is essential. However, production of a formal report can be avoided if it deemed necessary to undertake a site investigation. Some site such a petrol stations and scrap yards will definitely need a site investigation. So it would seem surplus to requirements to produce a formal desktop study report. However there should always be a desktop element within the site investigation, underlying geology, location of potential hot spots, made ground can all be identified via desktop study, and as such a review of available data should be included whether this forms part of the desktop study or part of the site contamination assessment report. Is a Desktop Study just used for planning applications? Most of the desktop studies undertaken by southwest environmental are for planning applications, whether these applications relate to a new project or change of use. However desktop studies are also used in some other areas of our work namely site condition reporting for environmental permits. When used in site condition reporting there are used to assess likely ground quality, and provide a qualitative baseline for soil quality at the time of reporting. SWEL have carried out over 50 desktop studies in Bristol and the surrounding area. Both geotechnical and geo-environmental. The geology of Bristol is very varied, many of the rock types in higher areas have been subject to local mining for coal. Coal can cause a number of problems for developments, the first factor is the holes left behind when people have dug out the coal. 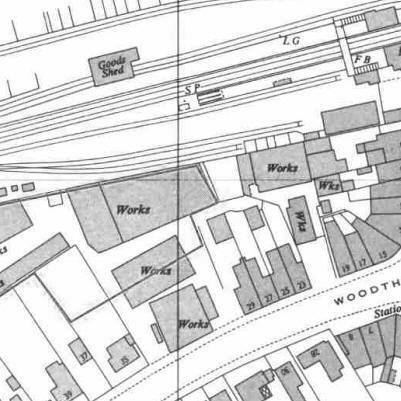 These are sometimes shown on historic mapping but often not. These holes can be filled with loose fill, which creates strength issues, or can be filled with unclean material which would be an environmental consideration. The second factor is the coal itself, which is some cases can create very strong odours. The picture to the right shows a rock outcrop in Bristol where you can clearly see the bands of coal running diagonally. There was a noticeable odour on site, which emanated from the coal. So if there is coal under you site then this may complicate you build. But not always. In the lower regions of Bristol (Cabot Circus / Broadmead) there are significant thicknesses of liquid silts overlying red marls, these silts do not hold up weight at all well, so most large buildings in this area have piled foundations. Also to consider in this area are underground rivers! Which are worth considering. From a legislative stand point the whole of Bristol is considered brown field. This may seem excessive, especially when considering fairly innocent looking back gardens etc. We would be reluctant to recommend a Phase 2 Assessment in these situations, unless there was specific evidence that points to that requirement. However, it is sometimes the case that a favorable conclusion in our Desktop Study is not accepted by the Bristol City Council, who will not accept the Desktop Study Report on the grounds of their own local knowledge of the site. The Good news is that Bristol City Council are the most pragmatic council when it comes to specifying Phase 2 Assessments, which are normal very onerous. Bristol City Council are willing to stick their neck out, and recommend fewer samples than normal, often from shallow horizons which can cuts costs by 70%. There are many historic industrial areas in Bristol, some of which are known to be contaminated. The geology of London is comparatively uniform, when considering other areas. It is often common t o encounter London Clay or Terrace Gravels in London. If gravels are thick, then this makes for cost effective foundation in smaller buildings, but often a piled solution is required. A desktop study will inform of the thickness of the gravel on site. 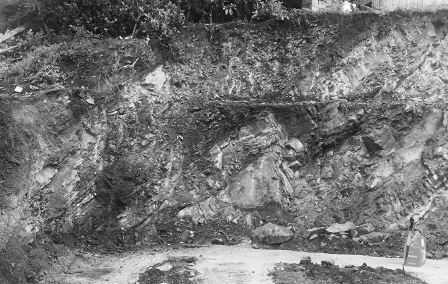 The mining of clay for bricks and of gravel of concrete has created many voids in the London area which have been filled over the year with all manner of materials. Brick making is a historic activity which has thrown up some very high levels of contamination is very innocent looking back gardens. The problem is not the mining of the clay, but the firing of the bricks which was often arranged in piles mixed with fuel of anything which was flammable. It is therefore possible to find very high levels of heavy metals, in certain spots across of brick field. 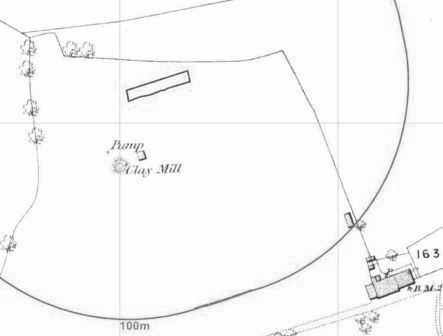 The problem is that the firing location is not marked and the brickfields are very large areas. . . . . .
As well as this pot luck brick field element there is also the more standard historic industrial uses to consider. Evert expanding London sees the development of past industrial sites for housing. A more recently the conversion of industrial buildings under permitted development rights. Large areas of London were bombed during the war, and these were often developed for housing in the post war period. These bombed areas were sometimes industrial, sometimes residential. A desktop study was carried out some years ago for an areas of a site in London labeled "works" which used to produce instrument dials for plains during the 2nd World War. It transpired that dials of this period often had radium activated phosphorescent dials, which were painted by hand. Radium is intensely radioactive, so particular care was taken on this site to protect future inhabitants, although it is recorded that workers used to lick their paint brushes to keep the point sharp! recording the dimensions of watercourses which might be affected by proposals. The data obtained as part of the desk study and collected as part of the field work will be processed and interpreted to complete the impact assessment and optional appraisal made where appropriate. Geological, hydrogeological and hydrological considerations have influenced the design of the proposed development. Mitigation measures which have been incorporated into the final design and layout of the proposed development are described, together with a summary of the design optimisation process carried out as part of the assessment if required. The methodology applied in the assessment is a qualitative risk assessment methodology, in which the probability of an effect occurring and the magnitude of the effect, if it were to occur, are considered. This approach provides a mechanism for identifying the areas where mitigation measures are required and for identifying mitigation measures appropriate to the risk presented by the proposed features. This approach allows effort to be focused on reducing risk where the greatest benefit may result, and thus inform options appraisal process.